For trucking and logistics companies, safety and compliance go hand-in-hand. Not only are non-compliance penalties stiff for companies and drivers, but compliance with local, state and federal regulations are part of the foundation of transportation companies’ safety programs. The most successful companies go above and beyond the requirements, as their customers have become increasingly educated on the importance of choosing carriers with strong safety records, knowledgeable dispatchers and experienced, safe drivers to transport their cargo. With FMCSA and DOT regulations ever-changing and drivers constantly on the road, it can be tough to get drivers quickly up-to-speed on new and updated policies. How does your company educate new drivers on policies, processes and procedures, and keep current drivers in the loop? Depending on how frequently your organization holds driver meetings, it’s a critical time to share policies and safety information with drivers, dispatchers and driver managers, as well as ask for their feedback and input. It’s a time to discuss current practices and what drivers are seeing on the job, and share ideas with each other on how to stay safe on the road. What policies and procedures should be covered? The above list is not exhaustive, but instead a starting point for what policies and procedures needs to be covered. Besides regularly scheduled driver meetings, how else can this important information be shared? 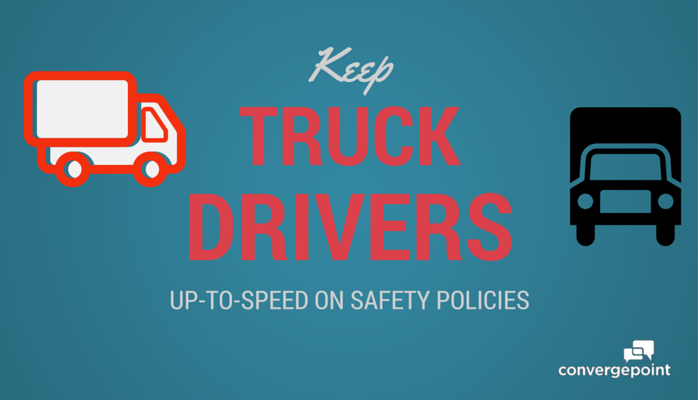 Policies and procedures can be included in the company handbook for drivers to take on the road with them. Printed handbooks can easily become out-of-date, leading drivers to accidentally reference outdated policies. To ensure drivers don’t mistakenly follow incorrect information, policies should also be stored electronically in an automated policy management system for drivers to access via computer when not on the road. The system can also send drivers email notifications when a new policy has been approved, and ask drivers to sign off electronically that they’ve read and understood it by requiring a timestamp acknowledgement or asking them to take a custom quiz. If your company uses Microsoft Outlook and many of your drivers have company email addresses only, consider using a policy management system on Microsoft SharePoint, so it can integrate with Microsoft Active Directory. That way, you can send email alerts about driver-specific policies to a driver-only Active Directory group. When used at the right time, technology can help (and not distract) drivers be safer on the road. For more information about how a policy management system can help you hold your drivers (and workforce) more accountable and compliant, read our How-to Guide.